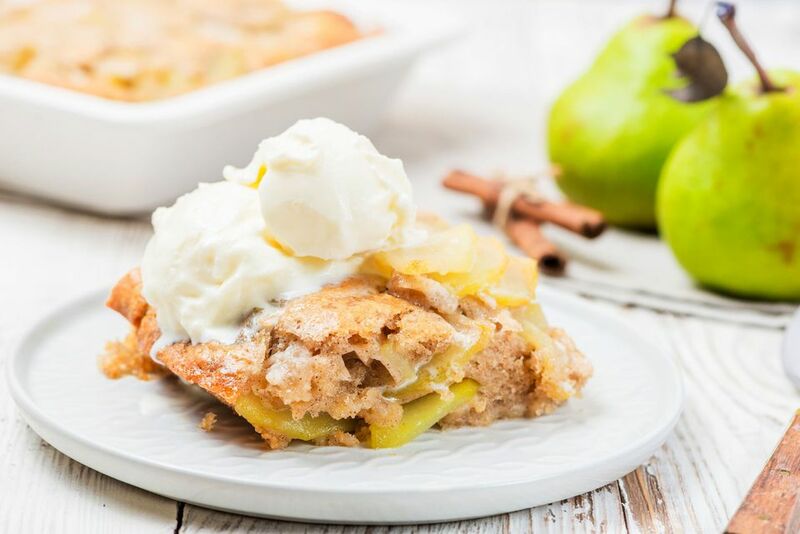 This is a popular pear cobbler recipe made with butter and cake-like batter, along with fresh pears. This is the easy type of cobbler. The cobbler is made with sweetened pears layered over the butter and cake batter ingredients and baked to perfection. Use firm, ripe pears. Bosc and Anjou pears are excellent choices. Or combine either variety with Bartlett pears. If you want to make pear blueberry cobbler, add 1 cup of fresh blueberries to the pears and sugar. It's as simple as that. Heat the oven to 325 F/165 C/Gas 3. Mix the pears with 1/2 cup sugar and let stand. Put butter in 2-quart baking dish and place in the oven until melted. Combine all dry ingredients, including the remaining 1 cup of sugar. Mix well. Whisk together the milk and egg in a mixing bowl. Slowly combine with dry ingredients to make a batter. Spoon pears over the batter. Do not stir. Bake in the preheated oven for 50 to 60 minutes, or until nicely browned and pears are tender. If the topping appears to be over-browning, cover the dish with foil and continue baking until the pears are tender. Remove the cobbler from the oven and set it on a rack to cool slightly. Enjoy the cobbler hot or cold with a scoop of ice cream or whipped cream. Some pears hold up better than others. Bosc and Anjou varieties are excellent in baked items. Bartlett and Comice pears tend to break down. For good texture and flavor, try a combination of a firm variety with Bartlett. Store a fruit cobbler at room temperature for about 2 days, or store it in the refrigerator for up to 5 days. For a pear blueberry cobbler, add 1 cup of fresh blueberries to the pears and sugar. Add about 1/2 cup of chopped pecans to the pear filling for additional texture. Sprinkle toasted slivered or sliced almonds over individual servings.